In January, we identified hallmarks of a structure that we use when working with a system or school over time. The following is the second of seven posts that serve to illuminate those hallmarks. These are comments we heard as we first left our classrooms and moved into the world of leading professional learning. The general consensus was that nothing we had done as teachers would serve us, or our learners, in this new role. As reflective practitioners, we quickly recognized that although there were some differences between learners under 18 and those over 18, there were also many similarities. The similarities became particularly striking when we applied the principles of assessment for learning to the professional learning experiences we designed. 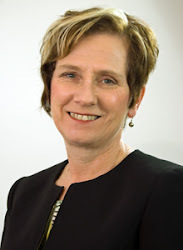 Just as with student learners, our adult learners become actively engaged in their own learning when, together, we identify clear learning destinations, explore quality and proficiency through samples and criteria, provide opportunities for self- and peer assessment, collect triangulated evidence of learning and set goals based on that evidence. And, just as it was with our students, these actions give our adult learners the confidence and the willingness to communicate their learning to others in formal and informal ways. When we deliberately link classroom practice to the ways in which adults engage in learning, there is another intended positive outcome. Research shows that when we impact the learning practice of teachers, we also impact their teaching practice. For example, a teacher who has experienced the power of differentiation is more likely to differentiate in his classroom; a teacher who sees the value of self-assessment through the lens of personal practice is less likely to suggest that it is an “add on” to his instruction. And so, the following two accounts provide practical examples of assessment for learning principles in action with adult learners. 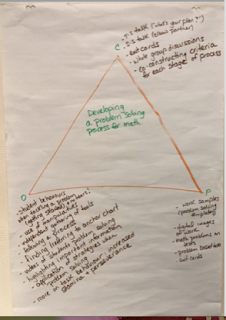 A group of coaches in a district in Ontario were working alongside teachers as they inquired into the mathematical process of problem solving. I was invited to, in turn, support the coaches in their facilitation of the inquiry. As we came to the end of the first term of the school year, I asked the coaches to consider the evidence that they were collecting that would prove their work was making a difference. When we examined their initial list, we noted that the majority of the artifacts were products. Because we know that evidence from multiple sources (products, observations, conversations) brings both reliability and validity to the data set, we identified further evidence that could be collected, as the inquiry continued - making certain to include both observations and conversations. We represented our thinking using a triangle (see photo) that could guide our evidence collection for the next six months. The quality of these coaches’ leadership could not simply be measured by product alone; a triangulated approach provided the fullness of their impact. Teachers at École Howden, a French Immersion school in the Louis Riel School Division in Winnipeg, Manitoba, were guided in co-constructing criteria on what counts in teaching writing in ways that maximize student achievement and joy in the process. Through ongoing work, teachers and leaders were provided with many descriptions of quality through demonstration lessons over the course of several lesson study weeks. These samples were used to co-construct criteria. 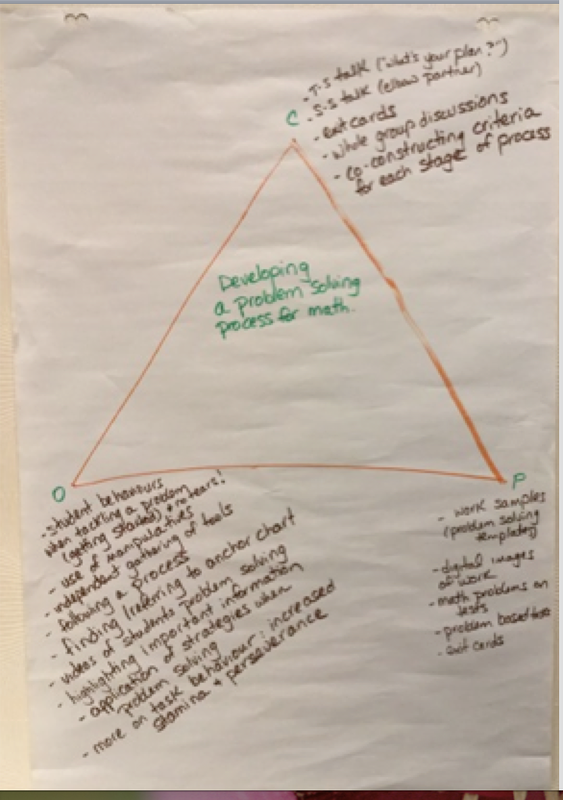 The criteria was then used by teachers to support each other in co-teaching contexts – collaboratively planning modelling lessons based on criteria – and goal setting contexts - one teaching and a colleague recording all language used to allow the first teacher to compare her language to the intentional use of language described in the criteria. The criteria made it safe for teachers to support each other, to collect evidence for each other, and to provide feedback for each other. Just as it does for students. In our next post, we will further examine the third hallmark that we outlined in January 2017 - We plan for both leader and teacher learning.